A videoconferencing interview is a tool that is being used by several of the larger corporations and businesses. By using this technology employers are able to get in contact with interested applicants no matter the distance without having to pay for any travel expenses. The ability to save money is one of the most popular reasons why companies choose to use videoconferencing interviews. Another reason companies opt to use this method of interviewing is the sheer convenience of it. Videoconferencing can be done from nearly anywhere with an adequate internet connection. Interviews do not be held at a particular location. The flexibility is perfect for busy human resource representatives that may be unable to leave their current location to hold an interview. Potential applicants are also able to benefit from videoconferencing. If you are looking for a new job in a different city or state a videoconferencing interview is the perfect opportunity to find that new career path without having to spend money on a plane ticket or the expenses required for a drive out of state. For these reasons it is easy to see why companies are choosing videoconferencing over the more traditional interviewing formats. Basically, videoconferencing works much in the same way as traditional interviews. The only difference being that the interview is not held in person but over the computer. This does not mean that you should ignore proper interviewing etiquette and protocol. 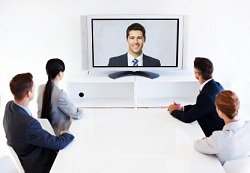 You should treat videoconferencing the same as you would any other interviewing session. You will need to take extra care when deciding what to wear to the videoconferencing. Black and other dark colors are not always suitable as many webcams are unable to differentiate a dark background from a dark suit or blouse. With proper and even professional lighting such complications can be avoided but often times you will not have access to such resources. Before it is time for the interview you should test the camera as well as the image it produces so you can correct any complications or lighting problems. Make sure that the camera focuses on only the top half of your body. You do not want to appear as a talking head and you certainly do not want to have your entire body on screen as it will distract from your face and eye contact. You should also consider applying a light powder to your face to reduce on camera shine. This applies to men as well. Focus on your cheeks, nose, and forehead and only apply a light coat. You do not want to wear too much make up but you do not want to look too oily either. Again it is important to test out how much powder to use before the interview. Many fail to consider their background choice during a videoconferencing session. You do not want the background to distract from you or what you have to say. You should also make sure that what is behind you reflects your professional manner and not what you enjoy doing on your time off or during weekends. A background of neutral tones or cream is best. Avoid windows and light sources that are located behind you as this will draw attention away from you. You may be lucky and are asked to go to a nearby location where a video operator is waiting for you. If that is the case the operator will make sure that the details are taken care of such as makeup and lighting. Above all else just keep in mind that this is just like any other interview even if it is over a screen and not in person. Treat the videoconferencing interview as you would other interview in a professional and polite manner.